In this paper a collection of control algorithms which are able to give rise to 2-sliding modes have been presented, and for each of them the sufficient convergence conditions are given. Furthermore, the real sliding behaviour is briefly considered, and, in some cases, the upper bound of the convergence time is given. 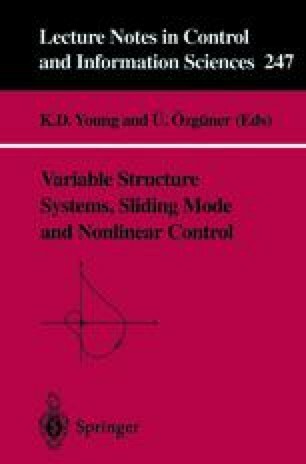 2-sliding mode control seems to be an effective tool for the control of uncertain nonlinear systems since it overcomes the main drawbacks of the classical sliding mode control, i.e., the chattering phenomenon and the large control effort. Its real implementation implies very simple control laws and assures an improvement of the sliding accuracy with respect to real 1-sliding mode control. The main difficulty in using 2-sliding mode controllers is the tuning of the parameters which characterize the various algorithms. Their values depend on the bounds of the uncertain dynamics and on the chosen sliding manifold, and only sufficient conditions for the convergence to the sliding behaviour are known. These conditions are very conservative, and, in practice, the parameters are heuristically tuned. It depends on the engineer’s experience to define which of the presented algorithms is more suitable for the specific control problem, even if, in the authors’ opinion, the super-twisting and the sub-optimal ones seem to be able to cover a large class of control problems with a remarkable implementation easiness.